The Wagtail Pool at Float Fish Farm has had some ups and downs since it opened. But it has settled now and clubs are looking to re-book matches on the lake again. Yaxley rod Mick Linnell topped the Wednesday open match fished in rough and windy conditions putting a hard earned 64lb 8oz to the scales from peg 10. Mick Atherton came in second not far behind on 57lb followed by Stuart Redman on 52lb 2oz. 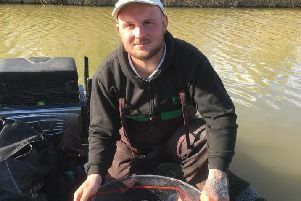 Whittlesey AA fished the Horseshoe Lake on the same complex and had a great day’s sport which saw John Hudson out in front with 83lb taken on meat on the feeder and later in the margins. Paul Wright came in second on 57lb 4oz followed by Jeff Tuttlebee with 42lb 6oz. Fenland Rods, Jay Lake, Rookery Waters: 1 Mac Campbell 43lb 1oz; 2 Dave Garner 41lb 2oz; 3 Les Bedford 38lb 14oz. Saturday Open, Magpie Pool, Rookery Waters: 1 Tony Dawson 235lb 12oz; 2 Graham Welton 216lb; 3 Kevin Peacock 149lb 8oz. Over 60s Open, Rook Lake, Rookery Waters: 1 Kevin Peacock 71lb 2 Ray Pullman 50lb 4oz; 3 Keith Rayment 49lb 10oz.